Localities continue to flock towards the GreenPak waste recycling scheme in an effort to improve Malta’s waste recycling performance. Seven more localities joined GreenPak during the past two years resulting in an average increase of 20% in the total recyclable waste material collected. By entrusting GreenPak to provide their communities with better waste collection services, local councils are offering superior services to their residents and business communities to separate waste. 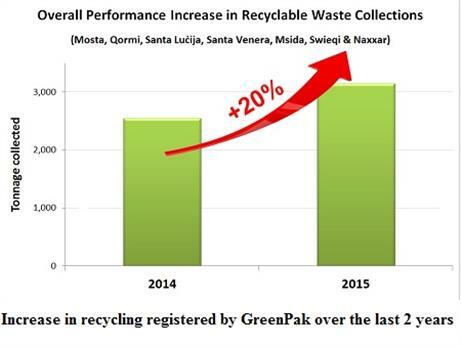 The surge in recycling is even more pronounced in certain localities, such as Mosta which registered a staggering 34% increase in total waste material collected in its first year upon migrating to GreenPak’s scheme. The localities of Qormi, Swieqi, Santa Lucija, Santa Venera, Msida and Naxxar all experienced significant improvements, most scoring higher-than-average percentage growth during their first year with GreenPak’s scheme. Following suit in a bid to improve its waste recycling rates, this month St Julian’s Local Council has also migrated to join forces with the growing family of localities serviced by GreenPak. As a way of gaining traction and increasing environmental awareness amongst the St Julian’s residents, free green recycling bags will be distributed to each household in addition to door-to-door educational campaigns. “In each locality served by GreenPak, we introduce amenities to help communities achieve higher environmental performance in an economically viable manner. This entails a combination of methods, including the provision of bring-in sites, kerbside collections and direct collections from commercial outlets. We make it a point to sit with each and every local council in order to address their specific needs and provide tailor-made solutions,” added Ing Schembri.